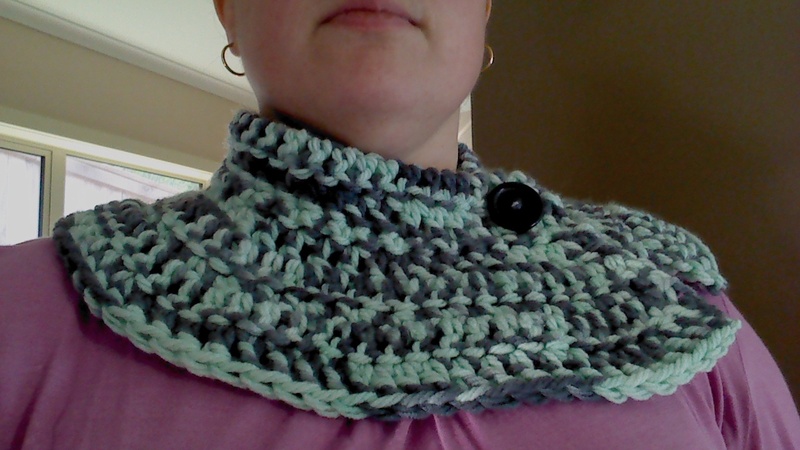 I found some great looking super chunky yarn at my local craft shop the other day (and it was super cheap!) so I grabbed a few balls knowing I could come up with something to make with it. 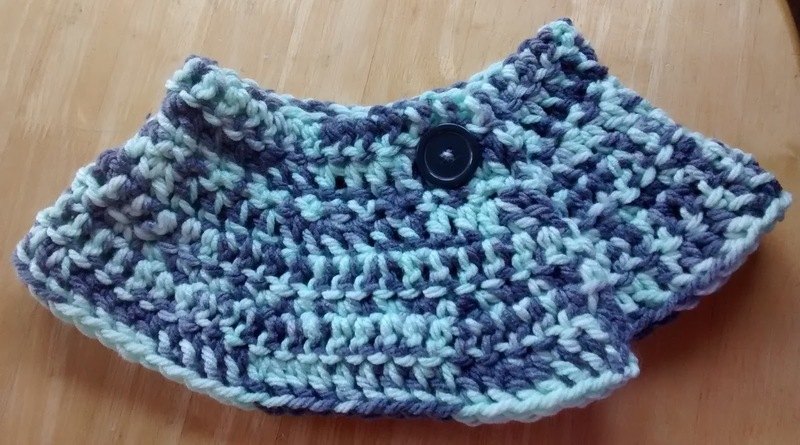 The button goes through any of the double crochet spaces, so it can be worn quite loose (and exposing a tiny sliver of shoulder) or nice and tight to keep all of the winter air from touching you! 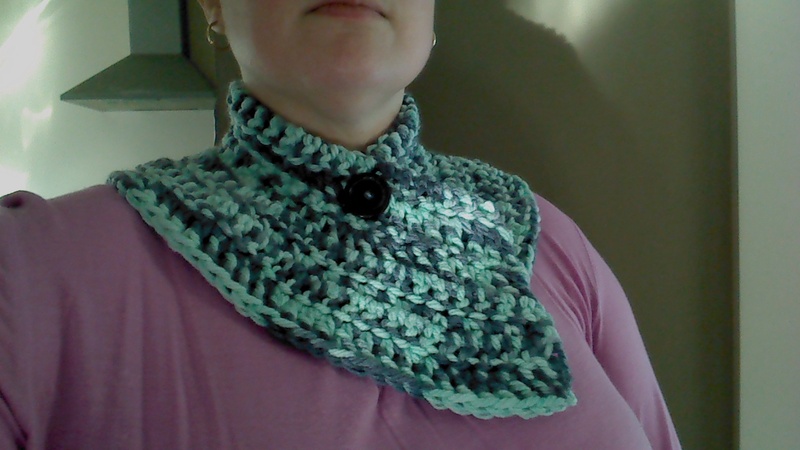 And because it sits nicely over the shoulders it goes great under a jacket or coat too without being too bulky. chunky yarn - I used one 100g ball of chunky acrylic yarn (approx 85 metres). Note: I used up the entire ball of yarn and I crochet quite tight. You may want to have extra matching yarn just in case. Chain 45 stitches (or more or less depending on your yarn & the fit you want). Dc in each chain starting in the 3rd chain from the hook, turn. Chain 3, dc in each dc to end, turn. Chain 1, sc in each dc to end, turn. Chain 3, *dc in each sc 5 times, 2 dc in next sc* until end, turn. Chain 3, *dc in each dc 5 times, 2 dc in next dc* until end, turn. Chain 1, *sc in each dc 5 times, 2 sc in next dc* until end, turn. Chain 3, *dc in each sc 8 times, 2 dc in next sc* until end, turn. Chain 3, *dc in each dc 8 times, 2 dc in next dc* until end, turn. 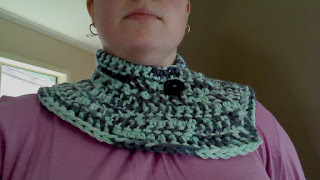 Attach button near the top, lining it up with the row of double crochets that you want to use at the button holes.